When you want to increase the aesthetic appeal and value of your home, as well as dramatically improve your home’s security, then you should consider quality professional landscape lighting. Landscape lighting can highlight all the work you have put into your yard and garden, increase the security of your home, and help you to enjoy the outdoors long after the sun goes down. Landscape lighting is a smart and easy investment that has many long lasting benefits for your home. Blooms Landcare provides our customers with high-quality landscape lighting services at competitive prices. Solutions for every application, security, decks, patios, ponds, landscapes, and more. A fixture that doesn’t attract mosquitoes. A pure, warm white light that enhances your home and landscape’s nature tones. No light bulbs to change. 15 year limited warranty on residential installations. With so many exciting features, you can see why Blooms Landcare recommends Kichler products to all our customers. There are many options and designs out there when it comes to landscape lighting. It can be hard to determine the best choice for your home. The best way to choose the right lighting for you is to follow a step-by-step process. First, focus on the effect you want from your lighting, not necessarily the product itself. Once you have a design in mind, your lighting professional can help you choose a product that matches your requirements. Second, focus on design and installation. If you have poor lighting design or sub-par installation, you will not get your desired lighting effect. That is why you need to choose an experienced lighting company with an eye for design. The best fixtures are not always the most expensive. You need lighting that will last and be able to withstand the weather. Durability is the most important feature. Flexibility of your design is necessary as your landscape will grow and change. Your lighting should be able to adapt as your landscaping matures. Trust a company that also provides on-going maintenance to keep your lighting looking great for years to come. When it comes to outdoor lighting, there are dozens of ideas and designs out there – so many, in fact, that it can be difficult to narrow down your options and pick the best lighting for your home. To figure out the best outdoor lighting plan for your household, it’s time to call in the landscape lighting experts! Here at Blooms Landcare, we’re devoted to helping you determine which products and ideas may work best for you. If you’re interested in Blooms’ superior landscape lighting services, please call us at (817) 688-5352 to schedule your personalized consultation with one of our many lighting experts. Artful Lighting. This type of lighting shines colored spotlights on certain features of your yard. Pathway Lighting. These lights illuminate your walkways. Safety Lighting. By illuminating your property’s dark space, you can increase its safety. Contact Blooms Landcare today to find out more about our top-notch outdoor commercial lighting services! We’re always happy to offer our assistance. Is your outdoor space in need of a fresh new look? There’s no better way to give your yard a much-needed makeover than by installing LED landscape lighting! There are tons of ideas and types of LED lighting out there to help you improve your yard’s aesthetic value – it can be tough to even know where to begin. This is where the landscape experts at Blooms Landcare come in. Here at Blooms, we’re dedicated to devising fully customized outdoor lighting plans for our clientele, using our years of experience and skilled services. Contact Blooms Landcare to hear more about our LED landscape lighting options and to schedule your initial consultation today! A home is the single largest investment anyone will make. It makes sense, then, that most homeowners are somewhat preoccupied with home security. One of the best ways to protect your home is to invest in exterior lighting. Security lighting effectively deters vandals and other home invaders. On a less extreme note, exterior lighting also protects homeowners and guests from via trip and fall accidents that might occur in the dark. At Blooms Landcare, we do more than cut lawns and create beautiful landscapes. We also install security lighting. Proper lighting should be mounted high enough to avoid tampering. Plastic guards or metal mesh typically protect these security lights. While spotlights are typical, floodlights also often work well. We can install exterior lighting in fenced-in yards, driveways, and near the house. Let us help you protect your home! 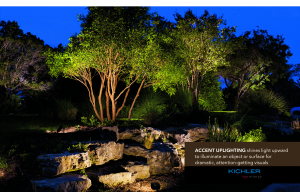 Are you interested in our Fort Worth landscape lighting services? Call Blooms Landcare at (817) 688-5352 to schedule your consultation with one of our landscaping experts.